Let’s be honest: everyone likes to kick back with a cold one every now and again. There is no reason to feel ashamed. But did you know that 5000 years ago the Chinese were doing the exact same thing? You might want to watch your step because I’m about to drop some knowledge. In the place of solo cups, early Chinese drinkers used vessels carved from precious jade. Now don’t get ahead of yourself and think they were tossing early versions of ping-pong balls into these cups, because that would be far from the truth. In fact, they rarely brought out the ‘good’ hardware because jade was considered a sacred stone and as a result was reserved for ceremonies. Considering that most examples of early Chinese jade have been discovered in tombs, it seems safe to say that the everyday use of jade was limited. The Hermitage is fortunate to not only have an outstanding Asian collection, but we also possess an unparalleled jade collection. Those in the know have said it is the best in the Southeast… but we don’t like to brag. On display in our East wing is a particularly fine example of a jade libation vessel. It is, in fact, the oldest piece in our collection (this means, obviously, that you should come see it). 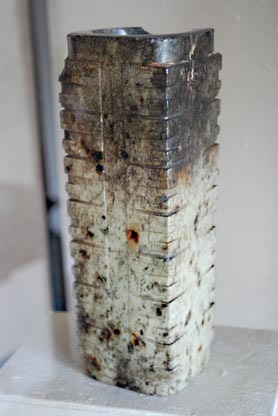 Standing at just over eight inches tall this prismatic stone cylinder demonstrates the superior craftsmanship of a culture that had not yet even reached the Bronze Age. Known commonly as a ‘Tsung’ or ‘Cong’, these ceremonial vessels were not always used for holding liquids. While it is exciting to think that the Chinese often engaged in ritual drinking sessions the realities of the vessel’s purpose were far more spiritual. The tall quadrangular form with hollowed tubular center is meant to conjure up thoughts of the connections between the heavens and earth. Eventually (during the Han dynasty, 206 B.C.-220 A.D.) the Chinese would identify the Cong’s shape as only a representation of the Earth. It would also be at this much later date that one might find this type of vessel in a more active daily role. In the case of our cong though we are dealing with a far more ritualistic piece that may have never been used by a human. Early congs were used for storage as well as serving as incense burners. Their presence was often a part of ceremonies that involved human burials and even sacrifices. It would be here that the vessel might have been filled with a potent wine that helped shamans transcend our earthly realm. Liquid courage was a popular item in Neolithic China, which ranges from well before 3000 B.C. to the end of the Shang dynasty in 1122 B.C. Alcohol would continue to disappear and reappear throughout Chinese history as both a tool for reaching heavenly states to simply being a refreshing beverage choice. A cong’s shape is not limited to the taller rectangular features like those seen at the Hermitage. Shorter and more bulbous shapes were just as common. What stays consistent are the motifs that show up on the vessels. Each of the carved tiers on the exterior of a cong showcase the standardized imagery of Neolithic China. Animal and semi-human faces tend to be the most popular figures to appear on early Congs. The Hermitage’s ceremonial vessel has a simplified version of an animal mask grace its slightly tapered tiers. If the vessel were to be seen in 2500 B.C. it would have had a thick dark brown shade throughout its entirety. This would have made the recessed animal motifs much more noticeable than they are today. The discoloration that can be seen stems from calcium eating away at the stone. Where once was a brown tint now is a cloudy shade of white. After all, this piece was underground for well over two millennia. Obviously there is far more to this vessel than a few short paragraphs on a blog can tell you. I encourage you to do a little research of your own, or if you really want, come to the Hermitage and have a look at it for yourself! Chances are I’ll be rummaging through our extensive Asian collection **cough cough, best in the Southeast, cough cough** and would love to see all of you enjoy what this museum has to offer. I look forward to sharing more of our collection with you over the next few months.